"Unless Canada is compelled to take back its waste and prosecute its criminal traffic, a great injustice will have occurred on the watch of everyone in this room," said Gutierrez. "We cannot allow that to happen." 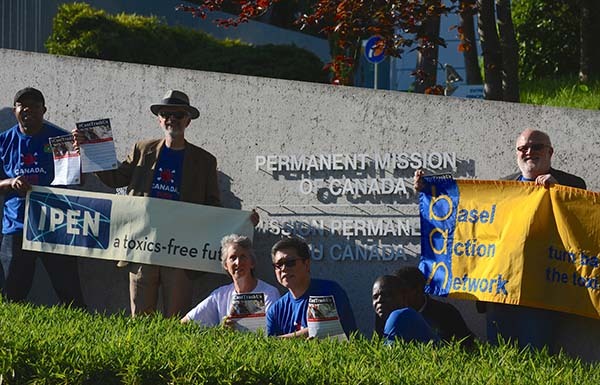 The Basel Convention prohibits trade of toxic and other wastes unless a country consents to it, and it requires the exporting country to take back illegal shipments and treat them as criminal but the Canadian government is dodging its responsibility by saying that they lack the domestic legislation to prosecute the exporter and it is therefore a "private matter" between the Canadian exporter, Chronic Inc., and its Filipino counterpart, Chronic Plastics. "Diplomatic bullying has snuffed the Philippines' resolve to enforce Basel. But even if the Philippines does not complain, such non-compliance cannot simply be forgotten. Bilateral non-Compliance is not acceptable under the Convention," said Atty. Gutierrez. "The Basel Convention was created to prevent rich and powerful countries from dumping their wastes on economically weaker countries," said Basel Action Network (BAN) executive director Jim Puckett. "Canada has acted as if it is a leader of the Convention and yet they have failed to properly transpose its rules into their national laws and have utterly failed to show that they really are serious about international waste dumping. Their stance is shameful." BT fears that disposing the Canadian waste in Philippine soil will not only set precedent for other rich countries' to dump their waste in the Philippines, exposing the surrounding communities with toxic fumes emitted through cement kilns and hazardous leachate from landfill disposal. Jim Puckett, Executive Director of Basel Action Network, email: jpuckett@ban.org, phone: +1 (206) 652-5555. Richard Gutierrez, Executive Director, BAN Toxics, email: rgutierrez@bantoxics.org, phone: +1 (587) 351-2635. BAN Toxics (BT) is an independent non-government environmental organization focused on the advancement of environmental justice, children's health, and toxics elimination. Working closely with partner communities and other NGOs in both the local and international levels, BT endeavors to reduce and eliminate the use of harmful toxins through education campaigns, training and awareness-raising, and policy-building and advocacy programs.